It’s going to be another great day for the New Albany Farmer’s market. 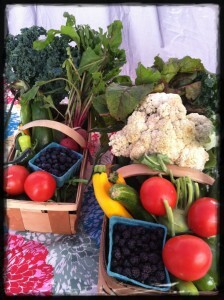 The market is open from 8-1, come down and see what’s in season. Don’t forget to place your order for our “Baskets of the Week”, I need them by noon Friday. As the season progresses they just get better and better, below is a picture of last Saturday’s basket. How beautiful they were! We’ll have CORN plus plenty of summer crops available… tomatoes are here along with green beans! We also have Swiss Chard, kale, cabbage, new potatoes, beets (a few more golden ones too), zucchini, golden zucchini, summer squash, green peppers, cucumbers, candy onions both red and white. Kenny has some fresh dug elephant garlic, along with some banana peppers and a few eggplant which are just beginning to produce. We will have blueberries and black raspberries. We won’t have a lot so come early to get your pick.